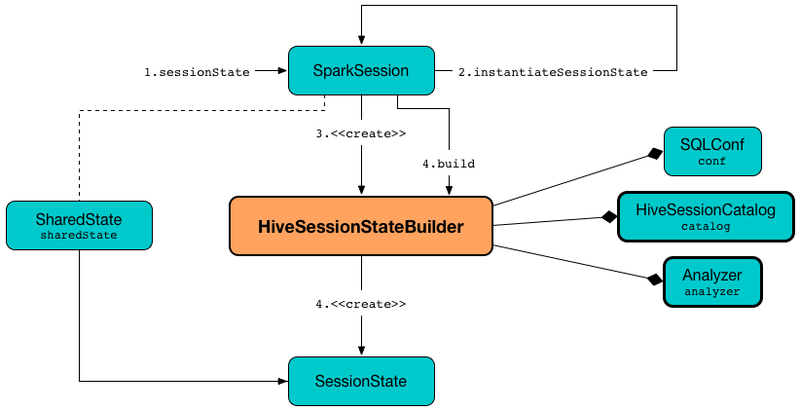 HiveSessionStateBuilder is a BaseSessionStateBuilder that has Hive-specific Analyzer, SparkPlanner, HiveSessionCatalog, HiveExternalCatalog and HiveSessionResourceLoader. Hive-specific logical query plan analyzer with the Hive-specific rules. planner is part of BaseSessionStateBuilder Contract to create a query planner. planner uses the Hive-specific strategies. analyzer is part of BaseSessionStateBuilder Contract to create a logical query plan analyzer. analyzer is a Analyzer with Hive-specific SessionCatalog (and SQLConf). analyzer uses the Hive-specific extended resolution, postHoc resolution and extended check rules. newBuilder is part of BaseSessionStateBuilder Contract to…​FIXME.